The decorative artefacts online store is different from most decorative designer clocks and designer mirror stores, as we offer only handmade, design-led artefacts to our customers. 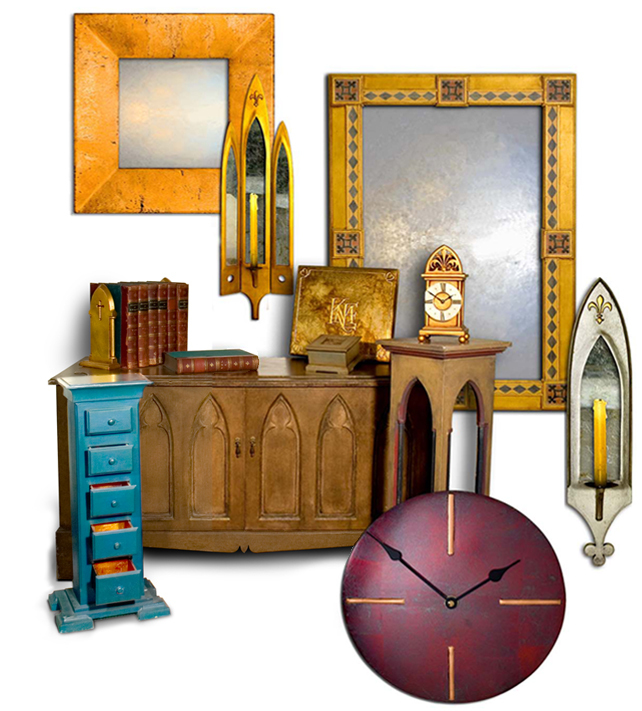 You won't find any of the decorative mirrors, clocks or accessories that are featured on this website, on any other designer clock or mirror website. Why? Because each luxury decorative artefact is manufactured in our workshops; handmade artefacts, manufactured to order and to the customer's requirements. By retaining control of the whole sales process, through manufacturing by our own experienced craftsmen to delivering the finished mirror or clock direct to your door, we miss out the middlemen, enabling us to offer luxury, bespoke designer wall furniture; decorative gilded clocks and mirrors, at straight-from the workshop prices. We can offer the ideal clock or mirror to suit the decor of almost any room. Our wall furniture designs encompass all of the traditional designs including Celtic, Gothic, Romanesque, Palladian, Art Deco, Empire, Egyptian and Regency and our craftsmen always welcome the opportunity to design new pieces inspired by any other era of design. Our decorative mirrors and clocks are finished in gilded leaf combined with numerous paint finishes, so we can cater for almost any decor. Our new ranges of tarnished metal leaf finishes are proving very popular, particularly the tarnished metal mirrors, as with the large choice of finishes that we have available, designing and manufacturing a designer mirror to suit a specific decor, can be achieved in most cases. Whilst we do offer pre-designed wall furniture collections, we offer all of our clients a fully bespoke service, offering bespoke wall clock and bespoke wall mirrors, sized and finished to our client's requirements. The decorative artefacts online store is constantly adding new collections, different designs and different finishes and of course, we offer our fully bespoke service, and if you can't see what you are looking for, don't hesitate to call us to discuss your requirements. Handmade contemporary decorative mirrors and clocks. Welcome to my eclectic collection of handmade contemporary & decorative mirrors & clocks, combining the finest traditions of English design, craftsmanship and quality, with a signature hint of eccentricity. So if are looking for anything from large wall clocks or Gothic mirrors to small Art Deco Mirrors or Contemporary Clocks and always wished you could afford the cachet, customisation and quality associated with a handmade, contemporary or decorative wall clock or mirror but didn't feel you could afford such a luxury then think again. the right advice and guidance . If on the other hand, you are looking for something a bit more special & can't find exactly what you are looking for but like the overall design and quality of my work then do not despair. Get in touch and let me know what you are after and I might well be able to make the mirror or clock you require and add the design to my collection. Choose an existing design or a customised version or bespoke clock or mirror. The simplest and quickest option is to choose an artefact from one of my existing collections. If you require a specific size or finish there is a second option which enables you to customise one of my existing artefacts. For the ultimate in exclusivity and customisation you can opt for my bespoke clock or mirror service and get the clock or mirror of your dreams. In the style of your choice…. Whether you're looking for a decorative style like a Gothic Mirror or Art Deco Mirror or more contemporary large wall clock then I'll have the style to suit you. Currently my collections encompass the major decorative movements including Gothic Mirrors, Art Deco Mirrors Gothic, Palladian, Empire, Regency, Art Deco as well as historically inspired styles like Egyptian, Romanesque and Celtic. If I don't have the style you are looking for, in my current ranges, then get in touch as I welcome the opportunity to work with exciting new styles. In the finish of your choice…. I specialise in gilded leaf and paint finishes so I am able to cater for most tastes. Traditional gilded finishes have a timeless sophistication but they come in only two colours -gold and silver. This is fine if you require a gold clock or silver mirror so to overcome this limitation I have developed an exciting new range of tarnished metal leaf finishes that offer a whole new spectrum of colours for you to choose from. In the size of your choice…..
You'd never consider purchasing a suit or dress that wasn't the right length or fit. Like a bespoke tailor I am able to make my decorative wall clocks & mirrors to the precise size and proportions you require. So whether you need a large wall clock or a small decorative mirror I'm the right person for the job. As handmade decorative mirrors & clocks I am able to off the personal touch. I can personalise my mirrors & clocks according to your wishes by adding a monogram, dedication and/or date. The right advice and reassurance to help you…..
By working directly with me you can call on my knowledge and expertise to help guide you, as and where you wish, ensuring you get the right artefact for you. a truly unique collection of handmade decorative clocks, mirrors and accessories.